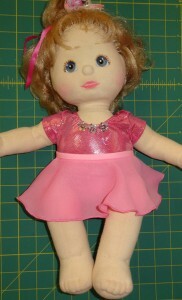 I received an email from Beth whose granddaughter has a favourite doll – a My Child Doll. 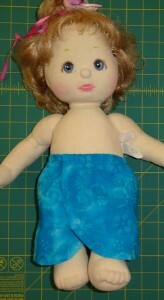 Because this doll has very wide hips she was stumped on how to make clothes for her. 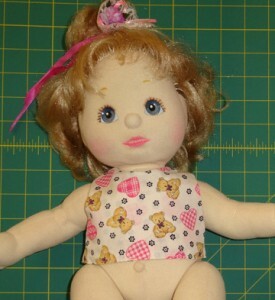 This was rather frustrating for Beth as she really wanted to make some doll clothes for her granddaughter so she could play with and dress her favourite doll. 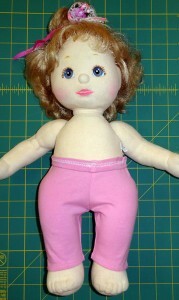 I knew exactly what Beth was talking about as I have a My Child doll too and she does have a rather awkward shape. So off to my sewing room I went on a mission to help Beth. Below is my reply to her and as I thought it may also be of interest to others I decided to share it in my blog. 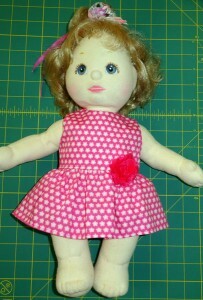 I have tried each of the 18 inch bonus patterns from my How to Sew Doll Clothes video course on my My Child doll and attached the photos for you to see how they fit. I have also included some additional patterns of mine that would be easy to adjust. 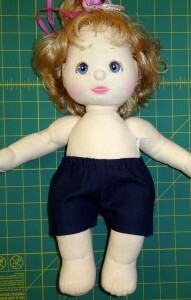 The bonus patterns that fit without adjustment include the sports shorts, crop top, frill hat and underpants. Tights from the pumpkin costume – cut ½” from the top of the front and back pieces. Ballerina – leotard needs to be shortened by folding pattern in half around the waist and folding up about ¾” (this will take 1 ½” from the length of the leotard). The tutu and skirt fit without adjustment. Summer Dress shortened or use the crop top and add a frill to make a summer dress. I don’t have a photo but the capri pants can be worn as long pants – just cut ½” from the top the same as I have suggested for the tights. And the handkerchief top can be worn as a dress – just shorten the strap about 1 ½”. 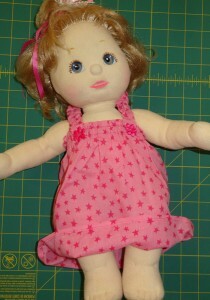 You may also find some of my blogs on resizing doll clothes patterns helpful and they can be found on my Rosie’s Resources page. 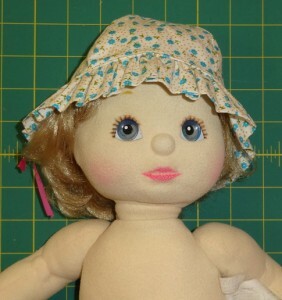 I hope this helps someone else to dress their My Child doll too as they are such pretty dolls and it would be a shame if they were forgotten about simply because they have no clothes. 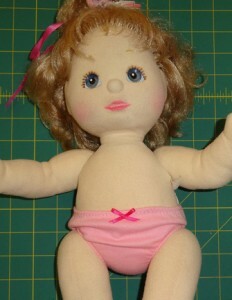 Lauren has an 18″ Australian Girl doll now but both my grandies have dolls of different shapes and sizes for us to dress. These tips and photos will be a great help for those who don’t sew much and a good reminder for the rest of us. Thank you for taking the time and trouble to answer Beth’s questions. 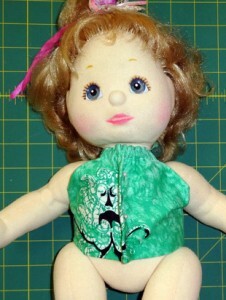 How would I adjust the cabbage patch clothes to fit the 14″ Cabbage Patch kids, they are quite narrow but have the bigger neck due to the head ring. I tried bringing the pattern down to 90% but am finding that makes the armhole a bit snug for squishing the arm through. While I as an adult collector am okay with that, I’m thining for a child that could be difficult to dress their own doll. 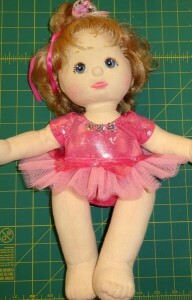 There’s lots of these smaller dolls out there but no patterns designed for them only the 16″ and 18″ ones. Hi Cindy, When you adjust a pattern by either shrinking or enlarging the whole pattern on your printer, you still usually have to make some minor adjustments and if you find that the armholes are a little small I suggest that you cut them out a little. You may find that by just taking 1/8 inch all the way around the arm hole it is now big enough. If you have sleeves and you are cutting the armhole out, it may be best to not shrink the sleeve pattern piece at all but simply take the length up the required amount to work on the shorter arms, or reduce them by a lesser amount as you need more of the sleeve to fit around the bigger armhole. Remember too that each different patterns will be slightly different because of the fit of the original outfit. 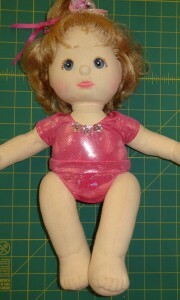 You may also find my blog ‘Different Sized Dolls Can Wear Clothes Made from the Same Pattern’ helpful. I hope this helps and I’d love to know what adjustments you end up making to have the clothes fit your 14″ Cabbage Patch Kids doll better. Hi Rosie! This is the exact help I have been searching for since finding my My Child Doll that I’d like to pass on to my daughter for her 2nd birthday! Thank you so much for posting this! !